This Caused Smoking to Drop 10% in a Year; Why Isn't the CDC Cheering? Another Adulterated Supplement? No weigh(t)! The Centers for Disease Control and Prevention’s 2015 National Health Interview Survey – the source for national smoking estimates – reveals surprising e-cigarette facts, summarized in the chart below. 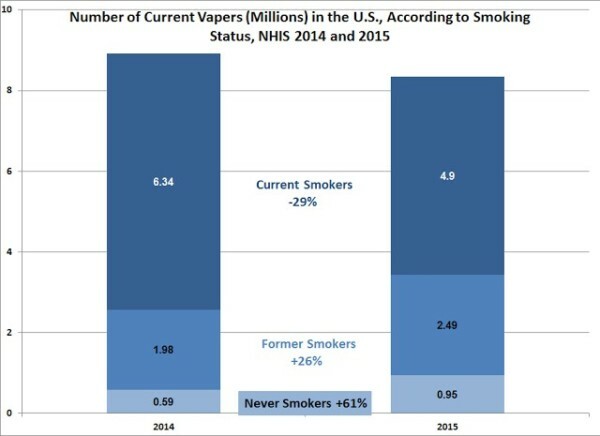 The figures demonstrate a 7 percent drop in current vapers from the 8.9 million reported in 2014 (here), due largely to a 29 percent decline in the number of current smokers who vape. In the NHIS survey respondents were current smokers and/or vapers if they used products every day or some days. In both years, 22-23 percent of current smokers vaped every day; the rest reported vaping, on average, about 7.7 days in the past month. Year to year, the number of former smokers who vape increased 26 percent, from nearly 2 million in 2014, to almost 2.5 million in 2015. The majority of former smokers (63 percent in 2014, 66 percent in 2015) vaped daily. Former smokers who vaped some days averaged 7.8 days in the past month. In 2015, there were nearly 1 million current vapers who had never smoked cigarettes, a 61 percent increase from the previous year. Most of this group vaped only on some days (5.5 days in the past month), although daily vaping increased from 16 percent in 2014, to 21 percent in 2015. As for cigarette smoking, the NHIS recorded a large decline in prevalence, from 16.8 percent in 2014, to 15.1 percent in 2015 – a 10 percent drop in just one year. As I noted previously (here), in 2014 the number of Americans who smoke dropped below 40 million for the first time in the 50 years that the NHIS has provided smoking statistics. In 2015, that number declined further, to 36.5 million. The fact that there were 2.5 million former smokers using e-cigarettes in 2015 does not prove that vaping is driving the steep decline in smoking. Similarly, the data fails to prove the claim that vaping is “renormalizing” smoking. The largest single-year decline in adult smoking was seen in the youngest age group, and it follows the substantial recent decline in teen smoking reported in this blog (here) but ignored by the CDC and other federal agencies. The 13 percent smoking rate among 18-to-24-year olds in 2015 represents a decline of almost half from 24.4 percent in 2005. This will eventually translate into significant public health gains, as lower smoking rates among young adults today will result in lower smoking-attributable disease and death rates in the future. Note that my previous research showed that NHIS-derived smoking rates may be underestimates (here), because they are always lower than those calculated from other federal surveys such as the National Survey on Drug Use and Health. For example, in 2012 there were 10 million fewer smokers reported in NHIS than in NSDUH (here). The inescapable fact is that e-cigarettes, used by, among others, 2.5 million former smokers, are not impeding the dramatic, welcome decline in cigarette smoking. Information about e-cigarette use was missing for 6 percent of respondents in the 2015 NHIS, so population estimates were adjusted accordingly. I would like to thank Carl Phillips for his insights and assistance with this post.